James Buchanan, Senator of Pennsylvania 1834-1845. 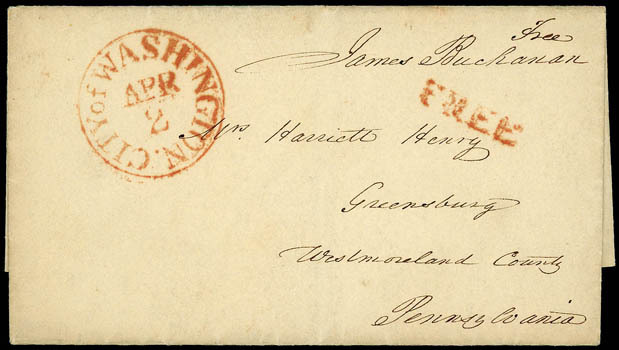 Free frank as Senator on folded letters to Pennsylvania, red "City of Washington, Apr 2" cds and matching "Free" handstamp, Very Fine and choice. 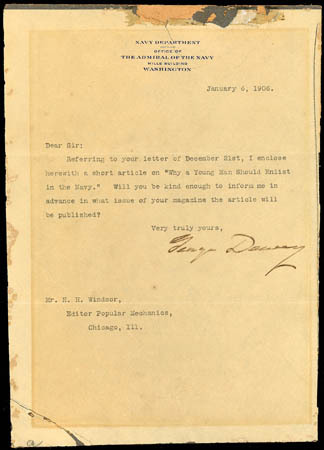 George Dewey, Admiral of the Navy; two signatures, one on January 6, 1906 cover letter to Mr. H.H. Windsor editor of Popular Mechanics in Chicago, Il. 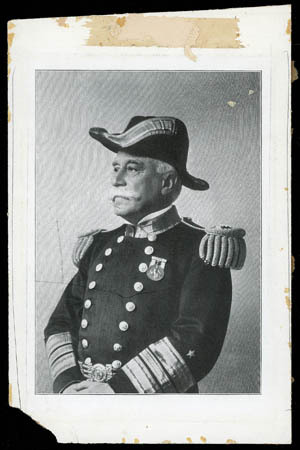 regarding his enclosed short article entitled Why a Young Man Should Enlist in the Navy, the other on the three page article giving praise to a naval career and it's benefits in the long run, quotes a Naval Lieutenant who echoes his sentiment and ends appealing to the patriotic desire of a young man; with two of the four pages on "Navy Department, Office of The Admiral of the Navy" letterhead, pages mounted on board with some paper splitting and chipping not affecting signatures, includes a printed photo proof of Dewey that was used in the article, F.-V.F. The article was eventually published in the March 1906 edition of "Popular Mechanics". 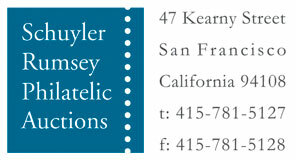 The third in a series on what occupation a young man should choose. Albert Gallatin, Secretary of the Treasury 1801-14. 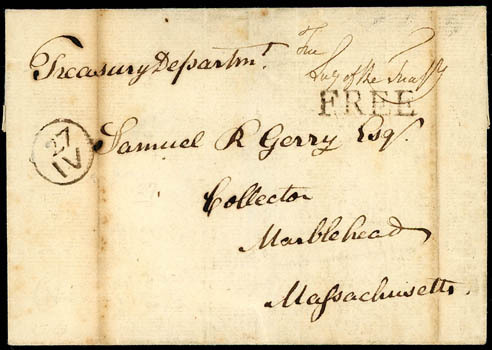 Free frank signature with Treasury Department above, on 1808 printed notice regarding cargo shipments to Gloucester, Mass., "Washington City, May 5" cds and "Free" handstamp, enclosure additionally signed by Gallatin, Very Fine. 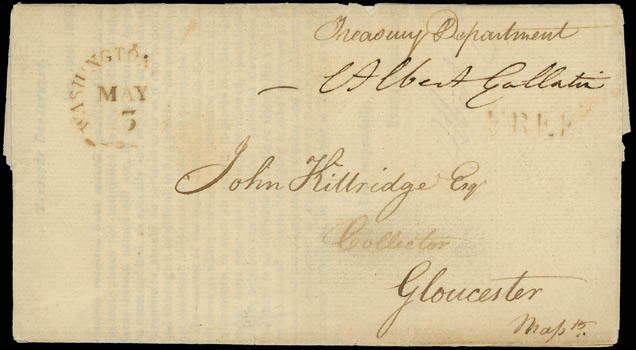 Alexander Hamilton, 1st Secretary of the Treasury 1789-95, manuscript "A. Hamilton" free frank signature as secretary and "Treasury Department" on folded letter sheet to the Collector of Customs in Philadelphia, Pa., with light straight line "New York Oct 13" postmark and matching "Free" handstamp at top; light tone spot, Very Fine. A RARE ALEXANDER HAMILTON FREE FRANK AS THE FIRST SECRETARY OF THE TREASURY SERVING UNDER WASHINGTON. An early American leader, Hamilton served as an aide to Washington during the Revolution. He was later a delegate to the Constitutional Convention and co-wrote the Federalist papers. As the first Secretary of the Treasury, he stabilized the nation's finances. A champion of a strong central government, he died in a duel with political foe Aaron Burr. Alexander Hamilton, free frank endorsement "Free, Secy of the Treasury" by Alexander Hamilton and Philadelphia "27 IV" Franklin mark on 1793 folded cover to Samuel R. Gerry, Collector at Marblehead Mass. 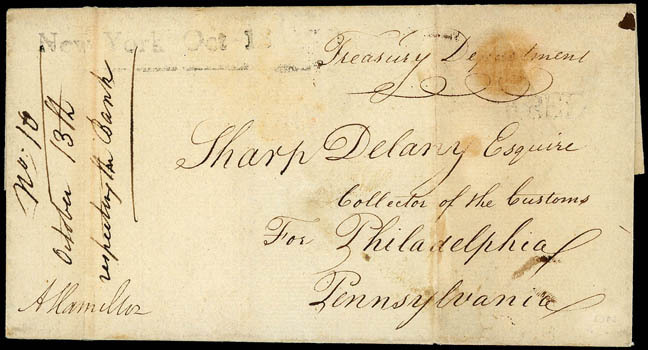 ; some fold toning, Fine and scarce version of the Hamilton free frank as Secretary of the Treasury. In 1777, Alexander Hamilton became General George Washington's assistant. In 1788, he convinced New Yorkers to agree to ratify the U.S Constitution. He then served as the nation's first Secretary of the Treasury, from 1789 to 1795. On July 12, 1804, in New York City, Hamilton died of a gunshot wound that he sustained during a duel with Aaron Burr. Thomas Lera wrote an interesting article illustrating a similar style Hamilton free frank as Fig. 1 in the Collectors Club Philatelist (Vol. 90, No. 1 Jan.-Feb. 2011) on pages 53-54. James Madison, Secretary of State 1801-1808. 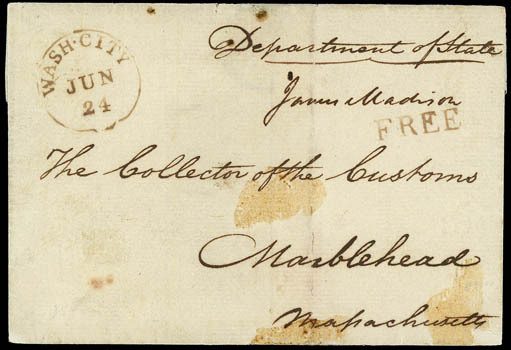 Free frank as Secretary of State on 1801 folded letter sheet to Marblehead, Mass., with "Department of State" endorsement at top, clear "Wash City, Jun 24" cds and matching "Free" straight line handstamp; few light stains not affecting signature, otherwise Very Fine. James Madison was appointed Secretary of State on March 2nd 1801 and served until he became President on March 4th 1809. 1901 Department of State U.S.A. Mourning Envelope for President McKinley Assassination, legal-size Official imprint blue mourning cover bearing 15¢ olive green (284), surface scuff, tied by "Washington, D.C., Sep 23 1901" machine cancel to Gotha, Germany at three times the 5¢ UPU rate, Oct. 2nd arrival backstamp, black Department wax flap seal, original enclosure no longer accompanies; some edge wear, a Very Fine use. William McKinley, the 25th President of the United States, was assassinated on September 6, 1901 inside the Temple of Music on the grounds of the Pan-American Exposition in Buffalo, New York. He was shaking hands with the public when Leon Czolgosz, an anarchist, shot him twice in the abdomen. McKinley died six days later on September 14 of gangrene caused by the gunshot wounds. He was the third American president to have been assassinated, following Abraham Lincoln in 1865 and James A. Garfield in 1881. 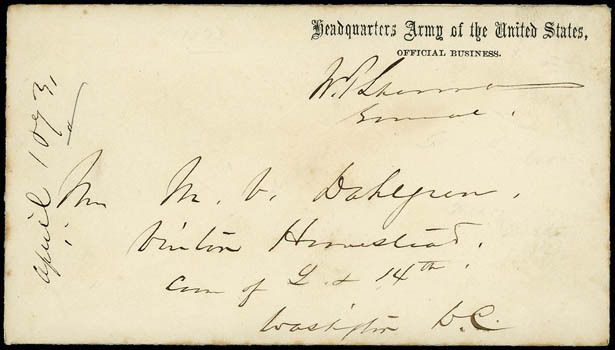 This cover is mailed only 9 days after McKinley's death. 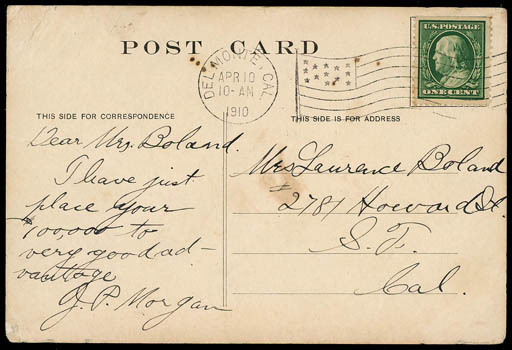 J.P. Morgan, famous banker and Financial Giant, signature on 1910 picture postcard (corner crease) of Pebble Beach Lodge Auto Road and cancelled Del Monte, Calif. card reads, "Dear Mrs. Boland, I have just placed your $100,000 to very good advantage. J.P. Morgan", Very Fine, Rare signature. William T. Sherman, Commanding General of the United States Army 1869-1883. Free frank endorsement on "Headquarters Army of the United States, Official Business" imprint cover, locally address and delivered to author Mrs. M.V. Dahlgren, docketed "April 10, 73" at left, Very Fine and choice. 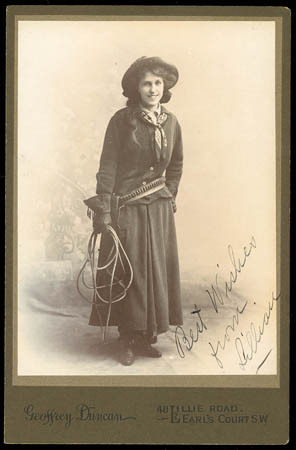 Lillian Frances Smith, cabinet photo showing Lillian in western costume with holster and whip in hand, signed "Best Wishes, from Lillian" in her hand at lower right; some mounting marks on reverse, Very Fine. Lillian Frances Smith was a young trick shooter and trick rider who joined Buffalo Bill's Wild West Show in 1886, at the age of fifteen. She was billed as "the champion California huntress" and was a direct rival to Annie Oakley in the show.